The Corona Classic Cut Bypass Pruner are the best bypass pruners based on the value they provide. As a gardener, there are some tools that become an indispensable part of your gardening life. Something that you’ll always find in your bag of gardening tools or holster. And one such tool is the handy bypass pruner. When you’re looking to prune small plants, branches, and shrubs, the bypass pruner will help you do the job fast without spending a lot of effort. But which bypass pruner is the best for your needs? Let’s take a look at some of them and help you make a good buying decision. What is a bypass pruner? Do you need a bypass pruner? A pruner can be used to cut plants and branches that are between ½ to 1 inches thick. To cut sometime thicker you’re going to need a lopper or a pruning saw. A bypass pruner has two blades that sweep past each other like a scissor to make clean, precise cuts. This will help avoid damage to the plants and allow them to heal faster. So bypass pruners are a good choice for pruning green wood. An anvil pruner has a cutting blade and an anvil blade. The cutting blade pinches the branch on to the anvil blade. Such a pruner can cut wood with ease but they don’t give as clean a cut as a bypass pruner. So an anvil pruner is useful to trim dead wood in your garden. Every gardener will need a bypass pruner because it is the most used gardening tool for trimming small plants and branches. 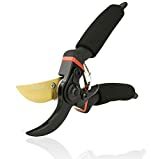 If you want to trim your plants to make them healthy, improve their growth, and keep them in good shape, then you should invest in a good bypass pruner. You’ll find a range of bypass pruners available but there are certain key factors you should be aware of that will help you make your buying decision. The cutting diameter is an indicator of how thick wood you can cut with the bypass pruner. A good bypass pruner is able to cut branches between ½ to 1-inch thickness with ease. The most important factor of a bypass pruner is the blade quality. It should be able to cut wood without bending, rusting, or losing sharpness fast. The best quality bypass pruners come with blades that are made of high-quality steel. This can be hardened steel or high-carbon steel so that they last you a long time. Some bypass pruners come with a sap groove that will help channel the sap during cutting so you don’t have to clean it frequently. You can also get blades that have a low-friction coating so your cutting becomes easier and it does not collect sawdust or sap as much. It could also have a non-rust coating to protect the blade from rust. It’s important that the blades don’t move around when you’re not using the bypass pruner. This will help prevent cutting yourself or some other objects accidentally. So it’s good to get a bypass pruner that comes with a locking mechanism that will keep the blades in the closed position when not in use. If you plan to spend a lot of time trimming plants in your garden then you should get a bypass pruner with a good handle. Make sure the handle has an ergonomic design so that you can prune comfortably without risking blisters on your hand. Such a design will also make them lightweight, strong, and non-slip. Most bypass pruners will come with some rubber cushioning on the handles so that using them feels comfortable. You can get bypass pruners with handles based on the size of your hand. If you have large hands, you can go for a large-handle bypass pruner. For medium sized hands, you get a medium-handle bypass pruner. And for small sized hands, you get a small-handle bypass pruner. Some bypass pruners come with rotating handles that help you cut wood with more ease. You do need to try them for some cutting because they need some getting used to. Many models of pruners have a spring in between their handles that push the blades apart as you relax your grip which lessens hand fatigue and your workload. Pruners that don’t have a spring work more like a pair of scissors which relies on your hands to pull apart the handles with each cut. The most common springs are either a wire spring or coiled metal spring. They both work well but you want to look for one that is attached lightly to its handles so it doesn’t get pulled off by a branch when you are pruning shrubs or accidentally pops off while you use the pruners. You will find some brands that integrate the spring into the cutting head so you don’t have to worry about the spring falling out or getting caught. If you’re going to use the bypass pruner for a lot of pruning in your garden then it’s good to get a lightweight one. Most bypass pruners are small due to their use of cutting smaller branches so you should not have many problems in finding one. The blades of the bypass pruner will be made of hardened or carbon steel but the handles can be made of fiberglass or metal that makes the bypass pruner lighter. However good is your choice of bypass pruner, there will be a time when it will get worn out because of all the pruning you did. The blades or nuts and bolts that hold them together might start falling apart because of the stress they come oner. So it’s good to have replacement parts easily available in case you need to get the bypass pruner in shape. Bypass pruners are pretty inexpensive considering the quality that you get and the amount of pruning you’ll be able to do with a pair. So my suggestion is to go for the best possible bypass pruner that you can buy because it will give you efficient cutting and need low maintenance for a long time to come. It’s always good to get as much warranty on your bypass pruner as possible because you never know what can go wrong while using them. Some bypass pruners come with a lifetime warranty which is a good thing to have. The bypass pruner is a very simple cutting tool that you should not have problems learning to use. But there are a few tips that you may find useful to keep in mind before cutting. Make sure the blades of the pruner are sharp and clean before using them. A dull blade will bend while cutting and put your pruner out of commission. So clean them with orange oil or vinegar and sharpen them before use. Bypass pruners can prune wood that is up to 1 inch thick. So don’t try to cut wood thicker than that with the bypass pruner. Doing so risks bending the blade or making them dull. If you feel that the wood is too thick or hard then use a lopper to get the job done. While cutting make sure to put the wood as deep into the blades as possible. This will give you good leverage to cut the wood as well as increase the life of the blades. After using the bypass pruner to cut branches, wipe them clean, then apply some oil and store them in a safe place. It’s important to keep your gardening tools in good shape so they last longer and give you great performance. The same holds true for your bypass pruners. The good thing is it does not take much to maintain them. Make sure the blades of the bypass pruner are sharp before you cut otherwise you may end up damaging them or the plants. To sharpen the blades you can use a sharpening stone or a hand file. If there is sap or rust collected on the blades you’ll need to clean them up. You can unscrew the nut and bolt attaching the blades to the handle. Then clean up the blades using orange oil, vinegar, or WD-40. Then apply some oil on the areas of the blade that are subject to friction and tighten the nut and bolt back again. It’s also good to clean the blades and apply oil before you start cutting and after you are done with the cutting. Corona BP 3180D Forged Classic Bypass Pruner with 1 Inch Cutting Capacity, Size 1"
You can get the Corona ClassicCut bypass pruner in several cutting options like ½ inch, ¾ inch, and 1 inch based on your needs. It’s a professional bypass pruner that has forged steel alloy blades that are high-quality and durable. The blades will remain strong and functional even after several phases of sharpening. The blades have a sap groove that will help channel the sap away as you cut. This will help keep the blades clean as well as prevent them from sticking as you cut. There is also a wire-cutting safety notch that will keep the blades closed when not in use. This will help prevent accidentally cutting yourself or other objects. The handles are ergonomically constructed and come with a non-slip grip that will prevent the pruner from slipping out of your hands during the cutting. The Corona ClassicCut bypass pruner comes with a limited lifetime warranty where you can return the tool or get a refund in case you are not satisfied with the product. It’s also good to know that the replacement parts are easily available for this bypass pruner. This bypass pruner weighs about 13.6 ounces which is a bit heavier than the pruners we have seen. But it is lightweight and you should have no problems using it for long cutting sessions. It would be nice to have more cushioning on the handles as the existing cushion feels a bit thin. The Gonicc professional bypass pruner can be used to cut branches that are up to ¾ inches thick. They are available with size variations for large and small hands. They have professional quality blades that are made of premium titanium steel with ultra-fine polishing technology. The handles are ergonomically designed and they are strong, lightweight and comfortable to use for a lot of cutting. The handles are also non-slip so they don’t fall out of your hands during the cutting. The blades have a sap groove that will help channel the sap away from them. This will avoid the blades sticking to each other while cutting as well as ease the maintenance of the blades. The Gonicc Professional bypass pruner weighs just 6.6 pounds which makes them pretty lightweight and comfortable to use for long cutting sessions. It seems to be hard to find replacement parts for this bypass pruner in case you need them in the future if something breaks. The handles have foam covering on them which might be uncomfortable to some people so you can consider taking them off before use. The Fiskars bypass pruner is ideal for cutting small branches and stems. The blades are made of precision-ground high-quality steel that keeps them sharp and durable for a very long time. The blades can cut branches that are up to ⅝ inches thick. The blades come with a low-friction coating that will help make the cutting effortless. It also helps keep the sap away from the blades and protect them from gumming up. You also don’t have to worry about rust getting to the blades for a long time. It’s nice that the Fiskars bypass pruner comes with a full lifetime warranty where you can have them replaced or a refund in case something goes wrong with the product. The handles are ergonomic and come with a non-slip grip so you don’t have to worry about them slipping out of your hands while cutting. The Fiskars bypass pruner weighs about 10.4 ounces which makes them pretty lightweight to carry around your garden. 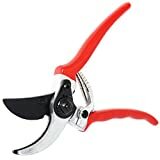 They are quite inexpensive so you can go ahead and buy a pair if you’re looking for a good quality bypass pruner at a good price. You may find that the blades stick in the closed position after some cutting and might need to use a little oil to loosen them. The Bahco Ergo bypass pruner is available in several cutting capacities ranging from ¾ inch to 1¼ inches. It also comes with handles for different hand sizes such as small, medium, and large. There is also a version that comes with rotating handles for small hands. It does not matter whether you are left or right handed as you can get one just right for you. The blades are made of high-quality carbon steel that is pretty sharp and will help you prune branches with ease. The specially designed head will help avoid wrist and arm strain. The handles are ergonomic with the top handle having a soft covering for keeping your hand comfortable during cutting. They are made from reinforced fiberglass which makes them pretty lightweight and durable. The medium sized version weighs about 9.6 ounces makes it a pretty lightweight tool that you can carry around and use in your garden. You may find the locking mechanism of the blades a bit difficult to use because of the strong push needed to use them. The Bahco Ergo bypass pruner is also a bit expensive when you compare it with some of the other options available. 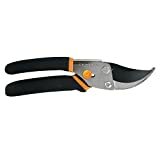 HARDENED STEEL BYPASS PRUNER - Heavy duty razor sharp blades let you trim and cut your garden trees, plants, vines, and shrubbery with ease. Features a wire cutting notch and a sap groove. Built to last! SAFE GARDENING TOOL - Shock absorption system eases impact and protects the wrist. Hardened bolt and nut to customize blade alignment for efficient operation. Safety latch to keep blades in "closed" position when not in use. VERSATILE EQUIPMENT - Ideal pruner for light applications. Trim or cut branches (1/2 inch in diameter), trees, vines, flowers, plants, small bushes, just about any garden plant. ERGONOMIC DESIGN - Lightweight metal ergonomic handles with rubber cushioning for a comfortable yet solid grasp. The My Cozy Home bypass pruner comes with hardened steel blades that are razor sharp and will help you cut branches that are up to ½ inch thick. This includes trees, plants, vines, and shrubs. It comes with a shock absorption system so that you don’t feel the impact on your wrist while cutting. So if you have issues like arthritis or carpal tunnel this pair of bypass pruners will be helpful for your pruning needs. The My Cozy Home bypass pruner comes with a safety lock that will keep the blades in the closed position when not in use. This will help protect you from accidentally getting cut. The handles are ergonomic and have rubber cushioning so they are comfortable in your hands. They are made of lightweight metal so you can use them for long cutting periods without getting fatigued. The My Cozy Home bypass pruner weighs just 8.8 ounces which makes it a lightweight pruner. A good thing is that this bypass pruner comes with a lifetime warranty. So if you have problems with it you can just ask for a refund and get a replacement. They are also pretty inexpensive so there is no reason you should not have a pair of these as part of your gardening tools. They are not the best when it comes to cutting thicker branches that are about 1 inch thick. Also, the handles might be too big for you if your hands are small in size. The bypass pruner is one of the most frequently used gardening tools that you’ll find. And now you should be able to select one that is most suited for your pruning needs. In our opinion, the best bypass pruner you can get is the Corona ClassicCut bypass pruner. You get a professional quality bypass pruner with forged steel blades that make cutting effortless. And you don’t have to spend a ton of money for such a good tool. If you are looking for a bypass pruner for some occasional pruning and don’t need a professional level tool then you can consider the My Cozy Home bypass pruner that is of good quality but comes at a really inexpensive price.